A few weeks ago we were invited by Porthleven Holiday Cottages to stay in one of their gorgeous holiday cottages right on the front at Porthleven. We arrived in the quaint harbour town early one wintery Friday evening. The location of the cottage was right next to the clock tower that is so infamous in Porthleven, and our views stretched right out over the beach and out to sea. We unloaded the car, dumping everything in the hallway and then ran outside and down to the beach. 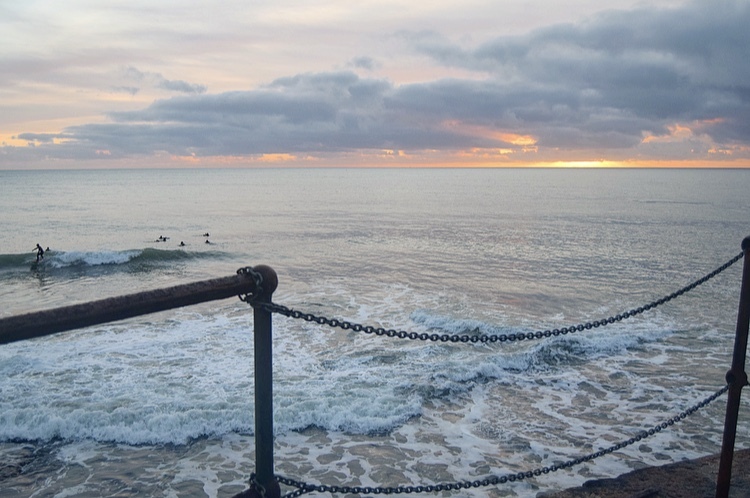 A group of local surfers were making the most of the fading daylight by catching the small clean waves that broke along the harbour wall. A not so lucky fisherman (as is often the case with fishermen) was gathering up his gear after an afternoon of "dipping my line into the water and pulling it back up again". Despite it being in the middle of winter there was still a buzz about the town which is so often the case with these tiny Cornish villages. The Locals were friendly and there was still a fair few tourists about which gave the town a reason to keep most of the shops and cafes open. We headed back to the cottage and opened a bottle of wine to have on the terrace. Despite being zipped into our winter jackets it was actually quite mild out and watching the sunset over the bay never fails to provide a warming effect on the soul. Our accommodation was a well kept three bedroom two bathroom sea front cottage that had a front garden that overlooked the beach and a back garden that overlooked the harbour. They also allowed dogs which meant that we got to bring our 9month old English Cocker Spaniel, Bailey with us. Having so much fenced off outside space was really handy for us and meant that he could wander in and out as it pleased him and we didn't have to worry about the road too much. That evening we booked into Kota Kai Kitchen & Bar for some Pan-Asian dishes and a couple of rock samphire gins. I walked in expecting it to be dead but on entry, I was met with warm lighting and a buzzy atmosphere. It became apparent that it was a favourite of the locals and after our starters came out I could understand why. Asian cuisine isn't something that's done all that well here in Cornwall, so it was a rare treat to dip our toes into such a unique menu and sample new and interesting flavours. After finishing our meal we wandered back through the village and collected Bailey from the cottage. We headed back into town and took him to the Harbour Inn Pub for a couple of drinks before bed. Saturday morning we headed into town to search out a place for breakfast. I had pancakes on my mind and was stoked to see that cafe 'Nauti But Ice' was open for business and was offering some pancakes with bacon and maple syrup. We got a table in the window overlooking the harbour and consumed pancakes and coffee whilst watching the bad weather clouds make their way over the ocean and finally begin to hover over the harbour town. The infamous Cornish mizzle (a combination of mist and drizzle = mizzle) had arrived. We decided to push on with our plans regardless of the wet and grey weather. I had seen some fab photos of the Loe Bar in similar weather and decided that it would be a great opportunity to head out and get some misty and atmospheric photos of the unique landscape just south of Porthleven. We headed through the town and along the coastal path, that was until the coastal path just disappeared into the ocean. A section of the coastal path had dropped off the cliff and into the sea making it too dangerous to continue along that path. The signs that were re-routing us around it was going to take a couple of hours. 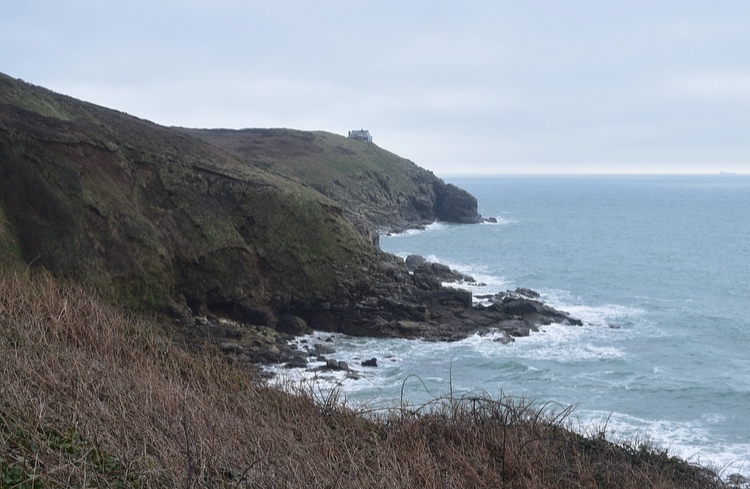 After assessing the situation we realised that we would have enough daylight to make it there but not back, so we put Loe Bar on the list for another day and decided to head in the opposite direction and walk North towards Rinsey Head instead. This seemingly tiny village is rich with history and not the boring kind of history that will send you to sleep. Its the fascinating history of smuggling and shipwrecks, storms and pirates. The landscape is littered with landmarks which each have their very own story to tell. The most notable landmark in Porthleven is the clock tower which has featured in many a newspaper photos, often with monstrous waves crashing over the top of it. The building itself is often mistaken for a church but is actually the Porthleven Literary Institute and now holds the offices for the town council. The building has stood there for over 100 years and welcomed sailors into the relative safety of the harbour with its glowing clock faces that were always lit (decades before the rest of the village has oil lamps). 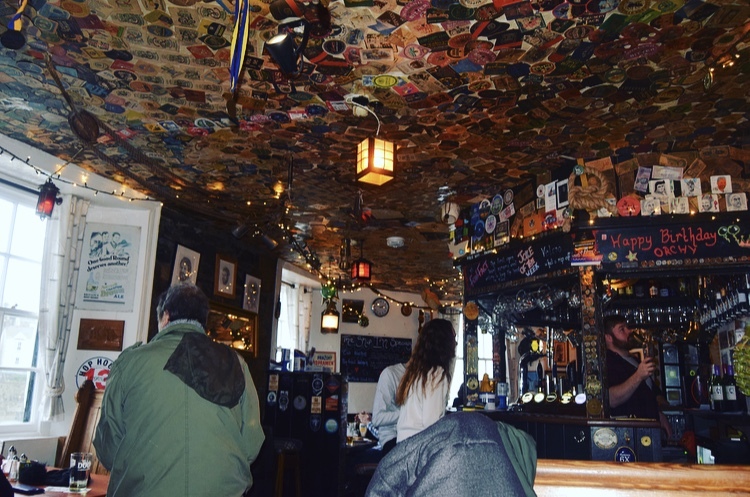 It stands on the grounds of the old Fisherman's pub which also used to provide housing to shipwreck survivors (of which there were many in Porthleven) so the site itself is steeped in history. As you walk along the cobbled path and along the harbour wall you may notice the salt cellar building that was previously used to store Pilchards that fed the local community but were also exported to places like Naples. Almost every building in Porthleven has a story to tell if you care enough to research it. 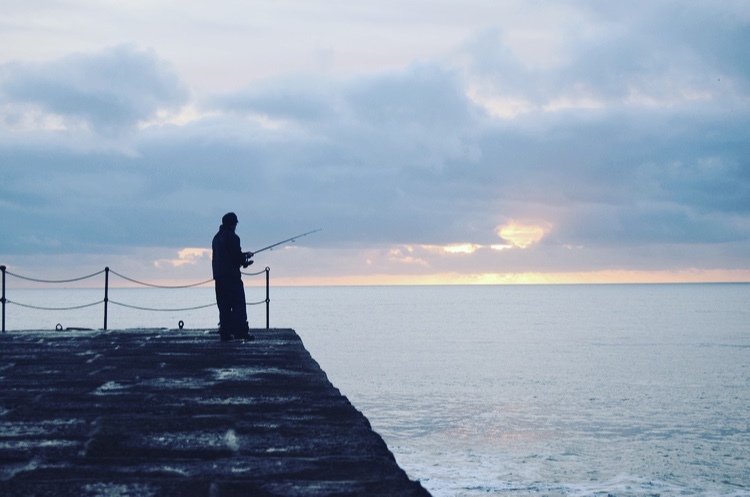 For those of you who are interested in this kind of thing, there is a great resource called The Porthleven Town Trail which takes you around the main landmarks in Porthleven and feeds you well researched but bitesize pieces of history. Perfect for children. You can find more details on that here they have also compressed all of this info into a convenient app. More info on their website. For those of you like enjoy a bit of meat to their history lessons there is a fabulous book written by Tony Treglown called PORTHLEVEN, a comprehensive history, which can be bought in a few of the shops in the village. Ask around and people will point you in the right direction. It was now about two o'clock and as we carried on walking through the village on our way to Rinsey Head a downpour hit conveniently as we were walking past The Ship Inn Pub. By this point, we were already pretty soaked so sitting by a fire in a 17th-century historic harbour pub certainly had its own appeal. The rain came in harder and stuck around for a few hours so we stayed for another pint, and then another, and then another. Never in our relationship have we ever spent the afternoon in a pub but we did on that day and it was blissful. We played cards by the fire, dried our clothes and Bailey made friends with the other local pooches. We left just as it was going dark at around 4ish and headed back to the cottage for a warm bath before dinner. That evening we had booked in for a late dinner at Amelies and dined out at one of the best pizzas I've ever had in Cornwall. This place gets my recommendation. Great views acorss the harbour too. The following morning we checked out of our cottage at 10:00 am and drove over to Rinsey head to finally do our walk that we have been planning. We walked from Rinsey to Praa sands and back again which took us a few hours including faffing about on the beach taking photos of driftwood and trees etc. Praa sands is one of my favourite beaches. There's nothing obviously spectacular about it like there is with Kynance cove or Porthcurno but it has this subtle beauty and Leigh and I have made some fab memories down there in the past which you can read about in my other blog posts. 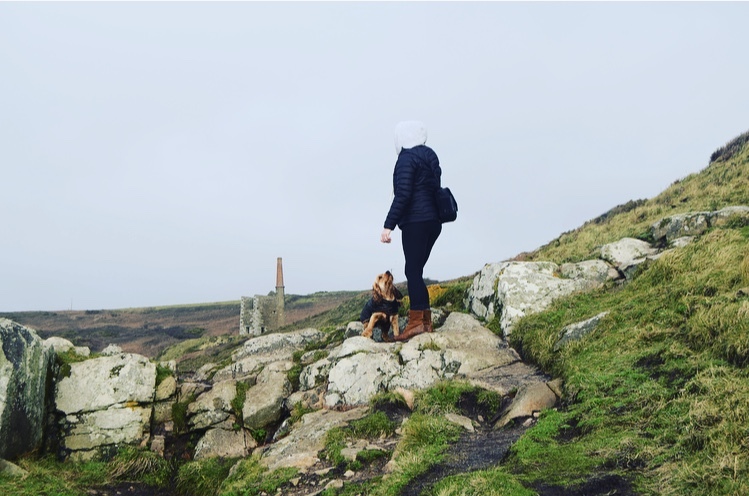 After our walk, we headed back to Porthleven and tucked into an epic Sunday lunch at Rick Steins before heading back to Newquay. We had a very slow paced and relaxing time down in Porthleven which makes a change from our usual agendas. Beauty really does have a habit of slowing everything down.